The Babergh Local Plan Alteration No 2, second deposit draft, is now available for public consultation. The plan may be read at Babergh Offices or the Town Council. The consultation period finishes on 23rd June. The plan sets out detailed policies and proposals for the control of development in the District up to the year 2016. It is therefore important that we look at what is both included in, and maybe excluded from the plan. The objectives specifically relating to Hadleigh are:-. · To protect and enhance Hadleigh’s role as a local shopping centre. · To preserve and enhance the town centre’s exceptional built environment for residents, shoppers and visitors. · To retain and extend accessible public car parking provision, and to ensure easy and safe access for pedestrians into High Street and other central areas. Policy HD01a. A site of 1.27 hectares on Aldham Mill Hill (we know it as Calais Street) adjacent to the existing Buyright store, as shown on the Proposals Map is proposed for a food supermarket of up to 2500 sq metres. Policy HD02a. Traffic calming is proposed for High Street, Magdalen Road and parts of Station Road and Angel Street. · provided it has no adverse impact on the vitality and viability of the centre. · Provision for substantial landscaping measures on the site’s eastern and southern boundaries. We have for some years known that a small residential development was proposed off Grays Road for 20 houses. The new proposal is for 90 houses with a large area for industrial use fronting onto the bypass, and spreading down almost to Durrants Farm. Amongst the previously policies which have either been deleted or ‘demoted to supporting text’ are those relating to the removal of over-head wires, and the policy relating to the District Council Headquarters car parking problems. There are no proposals or suggestions for the possible use of the land from the Brett Works to Bridge Street. We would have wished to see a proposal for residential and recreational use of that land. The Society will be making a response to the document when we have had the time to study it fully. If you want to object to or support anything in the local plan then forms are available from Babergh or the Town Council and you will need a separate form for each objection or approval. Support for the Buyright site allocation would be most useful in our fight against Tesco. Pull down each medieval edifice. Batten empty premises, Flatten out the churchyard. Why go on living in a town like this? Fourpence off a tin of macaroni. 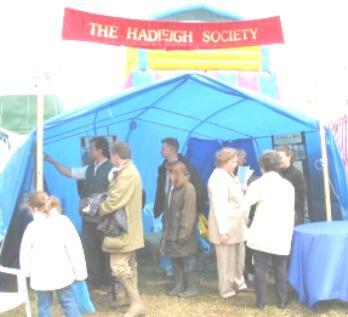 As usual, the Society’s stand at the Hadleigh show generated a lot of interest. As in previous years we showed some then/now still pictures but a new feature that caught people’s attention was moving pictures of the 1936 show. I wish to thank those of the Society’s members in the South Hadleigh ward who voted to allow me to serve another term on the Town Council. Members in the North Ward will have read in Mr Quinlan’s election address his section on the Supermarket in which he stated “The District council refuses to reveal details of the cost to rate payers of the public enquiry but some estimates put it at £250,000”. I understood that Babergh’s finances are open to the public and they have confirmed that the enquiry cost £125,000 including external advice. Whatever the cost of an Inquiry I believe that developers should not be able to force through their developments via the blackmail of threats of expensive enquiries, that although expensive to small councils are relatively only pocket money to large developers. Appeals and inquiries are part of the planning process and should not be bypassed to save money. The Executive Committee has concluded that both of the following recommendations deserve an award. ANDREW'S the butcher's shop in the High Street has been nominated for its recent refurbishment. The work done is modest but important in the context of the ‘feel’ of the High Street. The plate glass picture window has been replaced by purpose-made panes of glass. The whole frontage has been redecorated and the blind carefully retained. Station Yard, off Station Road, has been nominated for a build of high class housing on redundant railway sidings. The derelict maltings on the site have been sympath­etically converted and the character of the Station has been carefully retained. The Society’s web site is often visited by people researching their family history. This year we had an enquiry from Maggie Woodroffe in Australia whose relatives left Hadleigh in the early nineteenth century. The Woodroffe’s were planning a visit to Hadleigh and we were able to arrange to meet up, and spent a pleasant afternoon walking around the town. Sue Andrews has kindly looked for the family name, Sherman or Shearman and we will be sending them more information when they return home to Australia. Then I put my pink bag outside. Is a pink bag on the full side. Hasn’t got much input inside. ’Til it’s pink bag outside time. The fact that I am colour blind.